In our daily e-mail transcriptions Azucar and I like to converse life's little things. Like the other night she mentioned how she used Soft Scrub to clean up a small mess (though, if you've read her blog you know that no mess at Casa Azucar is small). Time has almost wiped (cleaned? bleached?) away my treacherous relationship with Soft Scrub. In my childhood we had chores that my dad would list (ALL CAPS) on a paper plate posted to the fridge. 1-SCRUB UPSTAIRS BATHROOM TOILET, TUB AND SHOWER. 2-CLEAN BANISTER AND VACUUM STEPS. 3-WITH A TOOTHBRUSH, SCRUB GROUT IN BETWEEN TILE IN KITCHEN FLOOR. And the list would go on . . . and on . 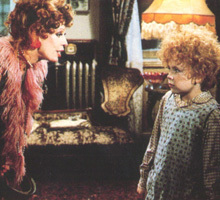 . . until Saturday looked like Miss Hannigan's orphanage. What a freakin' hard knock life! Annie never had it so good. By-the-way why didn't my dad use regular paper to dictate our workload? I don't know, but the very sight of a paper plate still gives me the chills. Grumpy Saturday chills. In our chore bucket was always a crusty bottle of Soft Scrub with Bleach. We used it to clean everything in our house, including countertops, tile floors and windows. Some of my siblings even brushed their teeth with Soft Scrub because Crest just wasn't doing it right. Sure their teeth were white, but what is wrong with yellow? Upon being reminded of this ruthless product I told Chup that we must go buy a bottle. I wanted to reunite and try to recover what relationship we once had. I've been a lazy cleaner as of late, and I am tired of these eco-friendly, politically correct, natural, comes-from-your-own cupboard products. By-the-way peanut butter is NOT a good solvent for cleaning the fridge. Boy am I a sucker! This reunion of sorts has reminded me of how grateful I am that my parents taught me to work, scrub, SLAVE away all those Saturday mornings. What is better than a clean house? And few things make me so pleased than when I hear my sister Page rebuff suggestions that she get a house cleaner for her spacious home. "That is why I had eight children." It's true, on Saturdays the whole house is busy with her little worker monkeys. Cute, sweating monkeys. You tell me. Are chores still part of the parenting repertoire these days? Are my peers giving their children scribbled out work lists on Saturday mornings? Have "work charts" replaced heavy-handed paper plates? Are people still using borderline hazardous cleaners to bleach the hell out of the ungodliness? Am I done asking questions in this paragraph? 'Cause you better believe that The Chief is going to know what his knees are for: scrub-bing.